Need your daily fix of free apps? We’ve handpicked 45 iPhone, iPad and iPod touch apps that are free today only. 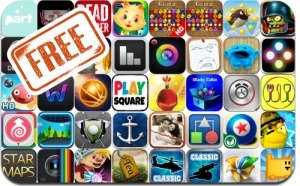 This apps gone free alert includes Gemz, StarDunk Gold, Box Cat, Max Adventure, Dead Trigger, iBlast Moki, Harbor Master, Gemz, Blow Me Up Beginnings, Penguin Wings, Eagle Eye, Apocalypse Zombie Commando, and many others. Where To Eat? – Find restaurants using GPS.